I don’t know about you, but I find delving into all things German on the Western Front pretty tricky at times. There’s the obvious language problem, of course, but I get by, and yet sometimes it’s the stuff that should be simple, like attempting to track down the location of the German cemeteries still to be found in France and Belgium, that proves problematic and time-consuming. I mean, do you know how many there are and where they’re all located? …and here’s the map. Tell your friends. This entry was posted in German Military Cemeteries. Bookmark the permalink. Sally and I visited Langemark three years ago and it was a very sombre experience – mass graves with 20,000+ burials. I do know that in 1954 the Belgian and German governments reached an accord that all known German war dead would be moved to three main cemeteries Langemark, Vladslo and Menin and that the 8,000 or so in Hooglede would remain. Yes, I too visited Langemark a couple of years ago, and we have a couple of German cemeteries coming up on the current tour. It seems that the accord you mention has taken on almost mythical status; I too thought that all the German war dead were concentrated into the four cemeteries you mention, but they quite clearly weren’t, or at least they were, but only in the Ypres area. 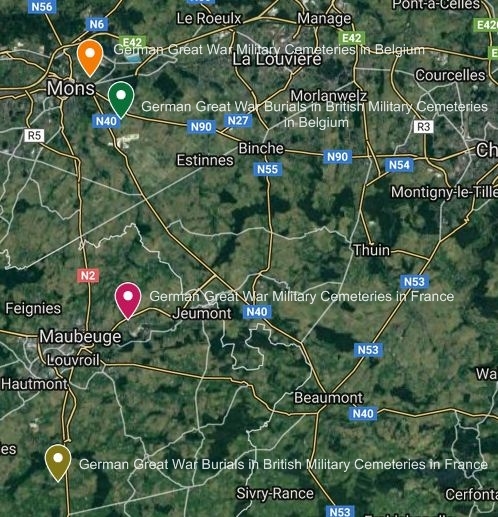 Elsewhwere in Belgium, as the map shows, there are a further 22 sites in Belgium that are not CWGC cemeteries that contain German dead. I just was not aware of this. But I am now. Interesting that you mention ‘all known German war dead’, because I have come across at least one example of post-war clearance where German identified dead were moved to one cemetery, and unknowns were moved to a different cemetery. There’s a comprehensive book on the subject of German war cemeteries in South-West-Flanders bij Jan Vancoillie: ‘De Duitse militaire begraafplaats Menen Wald’ (ISBN 9789082103908). It tells the story of all the smaller German war cemeteries that gradually were concentrated between 1954 and 1957 in four cemeteries: Menen Wald (between Menen and Wevelgem), Langemark, Vladslo (with the famous statues by Käthe Kollwitz) and Hooglede. Excellent resource site – you’ll enjoy it, I’m sure. Well if nothing else, M, people will be able to find the burials now with my super map (which can also be accessed through Google Maps itself). 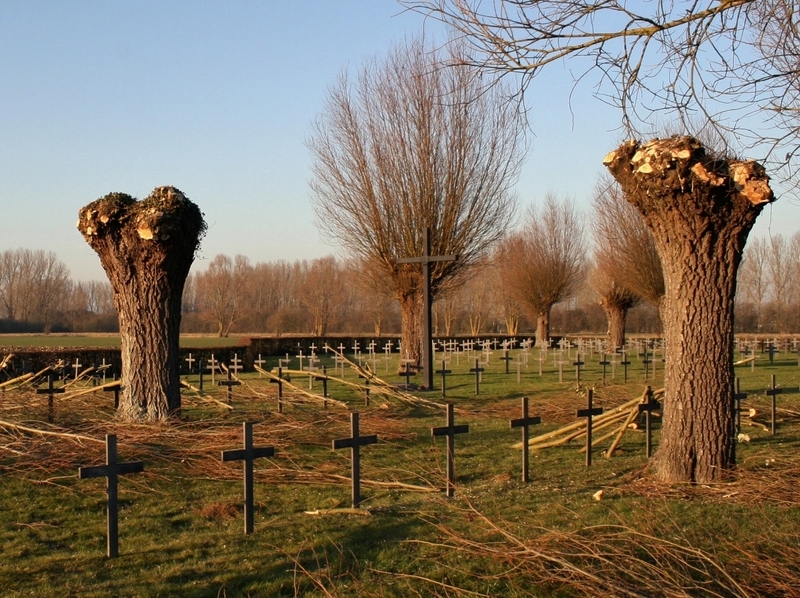 Well over 200 German burial grounds in France!! I was amazed, personally. And now I want to visit all of them……. I’m sure you will one day or at least have a good attempt at it. Great that it’s on google maps well done you must have taken hours of work. Thanks M. It did, over most of last week (especially frustrating at one point when I lost about eight hours work – you cannot save manually as you go when creating Google maps, so if the auto save gives haywire and you don’t notice………). Just seemed it was a required resource, and if I couldn’t find it anywhere (the VDK do have some maps but they are so complicated and time consuming to even attempt to use), might as well do it yourself. Merci muchly. Yes, it is! Makes tracing the whole front line, Channel to Swiss border, easy, doesn’t it? I could not believe there were so many. It is a staggering amount! I suppose in some respects we shouldn’t be surprised, and yet…. 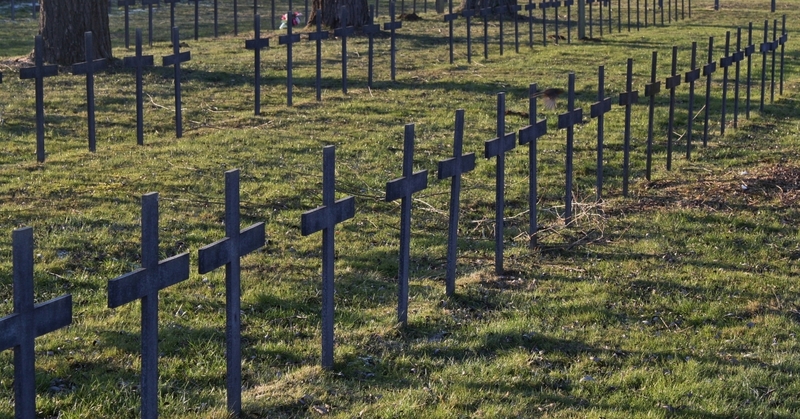 Visits to 200 German cemeteries will keep you off the streets for awhile and out of trouble! Indeed. Staggering that there are so many. Yep, I’m off in a couple of hours to visit all of them. If only……….